Check our Minutes and Agendas page for the agenda for our September meeting and the minutes from our August meeting. There will be a presentation by the Parks Department about the planned renovation of the Southeast Sports Complex. They are seeking input on the design theme of the updated playground area and broader park. You can see an preview of the presentation here to help give you context and generate questions. We’ll see you on September 5th at 7pm at ESD 101! The Parks Department will give a presentation to the Southgate Neighborhood Council next week about the proposed renovation to the Southeast Sports Complex and seek input on the design theme of the playground and park overall. The presentation will be during the regular SNC monthly meeting on Wednesday, September 5th at 7pm at ESD 101 on Regal Street. The most recent version of the Southeast Sports Complex plan. Phase 1 focuses on the playground area. 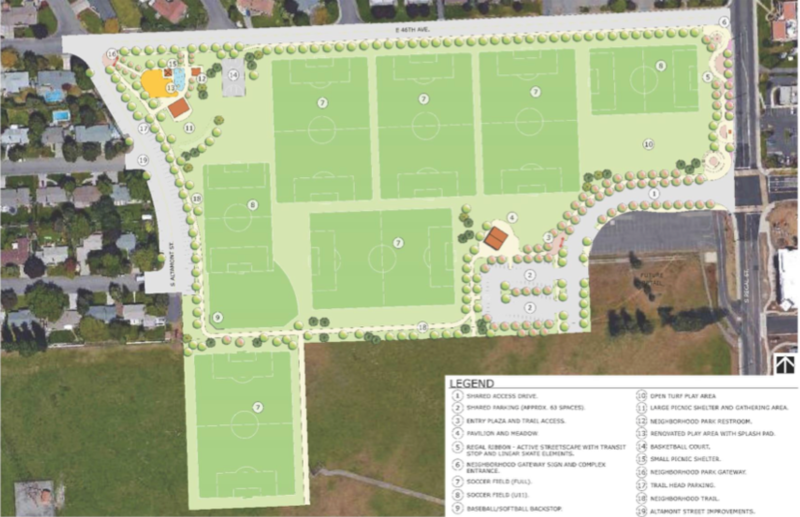 A copy of the presentation the Parks Department gave to the Spokane Design Review Board last week explaining the scope of the project and showing their initial ideas can be seen here. Check our Minutes and Agendas page for the agenda for our August meeting and the minutes from our June meeting (there was no meeting in July). We have no main presentation this month. We will be discussing the Sonneland Property Development and updates to the STA High Performance Transit and Southeast Sports Complex. We’ll see you on August 1st at 7pm at ESD 101! Check our Minutes and Agendas page for the agenda for our June meeting. The minutes from May are not up yet, but we will post them as soon as we have them. This month we have presentation about the proposed sports complex over in Glenrose at 37th and Glenrose Road. We will also be discussing the Sonneland Property Development ahead of the next Design Review Board hearing on June 13th. We’ll see you on June 6th at 7pm at ESD 101! Check our Minutes and Agendas page for the agenda for our May meeting and minutes from April. This month we have presentation about the STA Park and Ride being proposed for 57th Avenue and Palouse Highway. We will also be discussing the Sonneland Property Development. We’ll see you on May 2nd at 7pm at ESD 101! Check our Minutes and Agendas page for the agenda for our April meeting and minutes from March. This month we have presentation about the Lessons at the Library program that offers free music lessons at the Spokane Public Library. We will also be discussing the Sonneland Property Development. We’ll see you on April 4th at 7pm at ESD 101! Check our Minutes and Agendas page for the agenda for our March meeting and minutes from February. This month we have presentation from the Spokane Police Gang Task Force. Should be an educational evening, tell your friends. We’ll see you on March 7th at 7pm at ESD 101!